Enjoy mineralized, alkaline water at home with the Santevia Alkaline Water Pitcher. This convenient, hand-held pitcher fits in the door of your refrigerator, and restores your tap water to its mineral-rich state-just like nature intended. With a Santevia Alkaline Pitcher, you'll not only help maintain your body's healthy pH balance, but you'll also save money you would have spent on expensive mineral water in stores. It's a great choice for the environment, too, since one pitcher eliminates over 8,300 single-use plastic bottles every year! Filtration Process Using the same elements as nature's filtration system, Santevia adds calcium, magnesium and other beneficial minerals, and has been independently tested to reduce chlorine taste and odour, heavy metals, industrial chemicals and agricultural contaminants. 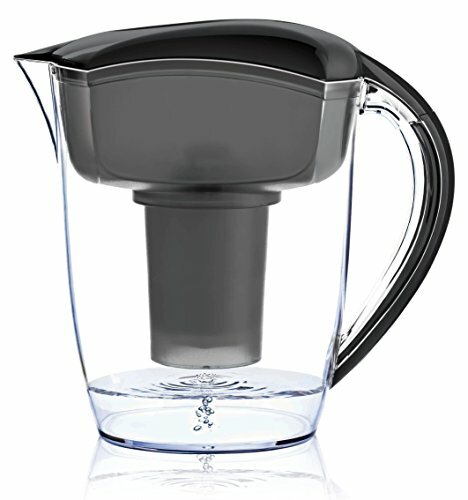 Filters double the water as other water pitcher filters. Each filter produces 1,250 8oz glasses - DOUBLE the amount of most pitcher filters. If you have any questions about this product by Santevia Water Systems, contact us by completing and submitting the form below. If you are looking for a specif part number, please include it with your message.